SST was founded to address the opportunity and need for advanced ceramics coatings in a variety of applications, as well as the need for fast, cost-effective methods for development of such coatings. Our coatings, produced through unique plasma spray processes, are better because they offer a combination of unique microstructure/properties and low cost that is difficult to achieve with any competing ceramic coating/membrane manufacturing process. With over a combined 70 years of ceramic coating development experience, our team has a proven track record of success for developing novel coatings for demanding applications. Our team can deliver high quality solutions that meet your project objectives, quickly and effectively. 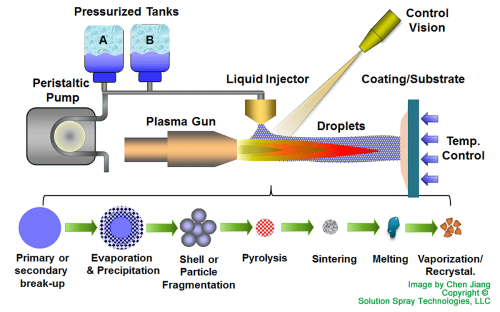 In particular, SST personnel have pioneered the solution precursor plasma spray (SPPS) approach wherein a liquid chemical precursor, containing the desired cations, is atomized into the plasma jet. The injected solution evaporates and the resulting salts are pyrolyzed, followed by melting and deposition as micron-sized splats. The SPPS process results in smaller splat sizes of <5 microns compared to 125 microns with plasma processes using powder, which makes many unique microstructures possible ranging from highly porous to highly dense. For example, the SPPS process can enable the deposition of thin (<50 microns), dense (<5% porosity) which is very difficult to do with powder based processes. A fast, high-throughput process such as SPPS can be game-changing enabler for the introduction of plasma sprayed ceramic coatings for a variety of applications.